Harvey Kurland, M.S. is a certified Chief Instructor of the Northwest Tai Chi Chuan Association. He is a direct student of Grandmaster Tchoung Ta-tchen and of Grandmaster Kuo Lien Ying. 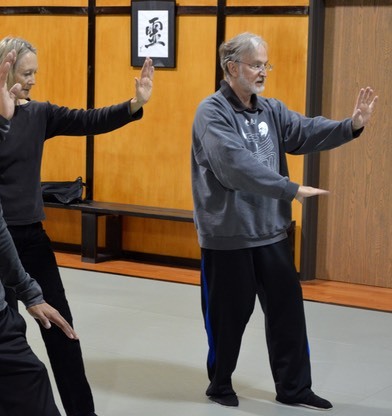 Sifu Kurland has studied T’ai-chi ch’uan and many other related arts since 1966. He is author of the book Ancient Mind-Body Techniques Revealed and has issued two videos on T’ai Chi. He also holds a Shodan in Aikido. He teaches the complete system of long form, pushing hands, San Shou, sword and walking stick, Ch’i Kung, as well as the circular Bagua training. Sifu Kurland is an exercise physiologist by training and his goal is to improve the health of his students. They have all greatly benefited by showing significantly improved balance, stress reduction and lowered blood pressure. He recently received his re-certification as a Certified Strength and Conditioning Specialist, from the Executive council of the NSCA Certification Commission.